Have you ever felt fear in your life? We all have. In order to move forward in our businesses or even as a parent, we have to be willing to do scary things. Leaning into the fear and doing it anyway is our topic for today. It’s been said that we cannot grow inside of our comfort zone. Growth happens just outside our comfort zone. What scary thing will you do today? If so, you’re going to love today’s conversation with Bonnie Bruderer, Founder of Binge Networks. Today we’re chatting all about using video to amplify YOUR message and increase your reach. Know someone that could benefit from today’s message? Please share. Want to put today’s podcast into practice? Join us for Ninja School where we’ll cover all the tactics and the tools we use here every day at OYC to get our message out to the masses. 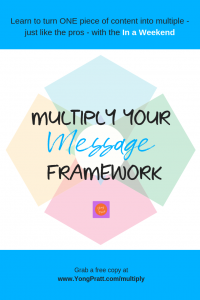 In just 5 days, you’ll have a strategy for automating and repurposing your message so you can spend MORE time with your kiddos this summer! This new series is inspired by the many individuals and families that step up to answer these questions and then create something awesome. Have you ever wondered what tools are inside a podcaster’s toolkit? Whether you’re looking to start your podcast or scale it, this week, Yong shares her personal toolkit and how you can get your own copy. When it comes to launching a podcast, there are a number of steps needed each time an episode is released. Today, Yong shares how she and Daphne have created a workflow for them and how you can get a copy of their Pod-Flow.